1814 Moves to Ashley, Wiltshire, and moves in with the Morgans in Calne (December). 1815 Dictates Biographia Literaria to Morgan, and prepares Sibylline Leaves for press. Annotates The Rime of the Ancient Mariner adding the glosses. Encouraged by Byron, he prepares Christabel and The Pains of Sleep and Kubla Khan for publication in 1816. Samuel Taylor Coleridge lived in Calne from October 1814 to March 1816. He, and his friends John and Mary Morgan and Mary’s sister Charlotte, rented a house in Church Street owned by the surgeon George Page. Living opposite St Mary’s Church, it is likely Calne reminded Coleridge of his happy childhood in Ottery St Mary in Devon where his father had been the vicar. 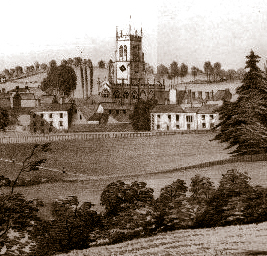 Coleridge came to Calne whilst recovering from a mental breakdown. He was friendly with the vicar poet William Lisle Bowles whom he admired and often visited sometimes borrowing a horse. Coleridge suffered from addiction to laudanum, the common painkiller of the time, which he purchased from Thomas Bishop’s druggists. Coleridge didn’t like the ale in Calne which he likened to “syrup or vinegar”. He even became involved in politics by galvanising the people of Calne in, “a speech replete with argument and with persuasive eloquence” to petition Parliament to oppose the Corn Bill because he knew it would cause suffering by keeping the price of bread high. Hartley, Coleridge’s son, spent the summer of 1815 with his father, before resuming his studies at Oxford in October. Coleridge’s highly successful play “Remorse” was performed in Calne. Whilst in Calne Coleridge wrote his “Biographia Literaria” in which he set out his ideas. He prepared for publication his opiate inspired poem “Kubla Khan” and his Gothic Ballad “Christabel”. He also made annotations to his most famous poem, “The Rhyme of the Ancient Mariner”. He wrote a Christmas play, “Zapolya”. The time Coleridge spent in Calne was perhaps his most productive period. Calne began as an Anglo-Saxon royal estate named after the river. “Calne” is a Celtic word for currents of water: Calstone, at the river’s source, shares the same root. The Iron Age hill fort of Oldbury, or “Old Borough”, was the ancient centre. There was a royal Saxon Hall in Calne as early as the 9th century, mentioned by Wulfstan of Winchester. King Eadred, grandson of Alfred the Great, bequeathed the Calne estate to the Old Minster Winchester in his will: he died in the year 955. Dunstan, the archbishop of Canterbury who was made a saint, was the subject of a miracle here in 978 when the upper floor of a timber hall collapsed during a fierce debate on whether or not priests should be celibate. Dunstan, who was losing the argument, maintaining that they should, survived by standing on the only beam that didn’t collapse with the floor. By the time of the Domesday Book in 1086, Calne had developed into a wealthy town with nine water mills, two of which were within the lands of the church. Calne had 70 burgesses, reflecting its importance then. 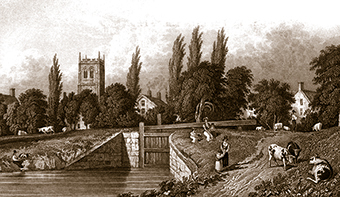 The river formed the boundary between church and town. In the early 13th century, Fulk de Cantelope, one of King John’s servants, acquired land here and probably was responsible for building a fortified manor house on the high ground to the west. This became known as the Castle but it did not survive into modern times. The Wiltshire antiquary John Aubrey who, in 1648 was the first to recognise the prehistoric stone circle at Avebury, visited Calne and asserted that there had been a castle on the site of a mansion now known as Castle House. Aubrey also described a charter from king Stephen which, although lost, strongly suggests a very early origin for the borough. In 1331 King Edward III encouraged the expansion of the woollen cloth trade by allowing skilled workers from Flanders to come to England to stimulate finishing processes like fulling and dyeing of the woollen cloth. For five hundred years, Calne was a centre for the working of woollen cloth assisted by a number of fulling mills along the river Marden. Workshops flourished and clothiers built fashionable houses on The Green. By the early 19th century the industry had moved to the west with the construction of steam-powered factories around Trowbridge, Bradford-on-Avon and Frome. The improving of the London to Bath road in the 18th century brought renewed wealth to the town as travellers stopped at coaching inns, the two largest being the White Hart and the Catherine Wheel (later renamed the Lansdowne Arms – now the Lansdowne Strand Hotel). Calne developed astride a droving route from Bristol to Smithfield Market in London. Pigs were rested overnight every 10 miles or so. In 1770 John and Sarah Harris opened a butcher’s shop in Church Street: they began to buy pigs deemed unlikely to survive the journey to London at the resting place at Black Dog, a mile to the west. From this enterprise their descendants built pork-processing factories in the 19th century. Traffic increased with road improvements and the construction of canals. A branch of the Wilts and Berks canal reached Calne in 1802. Coal from the Somerset coal fields and building stone from the Bath area, was unloaded onto the wharf. New Road, built as a result of the canal, replaced narrow Church Street as the main road. Charles and Thomas Harris joined their separate factories to become C & T Harris Ltd. In 1920 their five-storied brick factory was built next to the then library (now the Heritage Centre): it was to dominate the town until Harris’s closed in July 1982 and the factory demolished in 1984. Thirty five years on, the town has recovered from the loss and the black hole in the town centre left after demolition has now been redeveloped.